At it Again!’s very own resident poster boy, Niall Laverty, has been playing his part for the 1916 Rising commemorations. He recently took part in RTÉ’s ambitious project to produce 32 one minute short films – one for every county – that explore the stories related to the Rising. Niall portrayed Thomas Ashe, who led the 5th Battalion of the Irish Volunteers in the Battle of Ashbourne, Co. Meath. It was one of the largest combat operations by the Irish Volunteers outside Dublin during Easter Week. 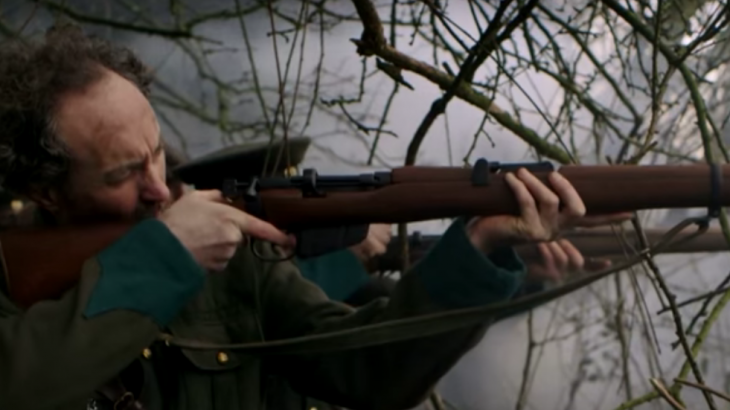 On a cold and damp morning earlier this year Niall and his small army of Volunteers were marched down into the fields of Ashbourne to recreate the shoot­out. After a short training session on how to shoot from a rifle with live ammunition, filming started in the trenches. No acting was required as the scene had such a visceral nature to it, thanks in no small part to the enthusiastic commitment from everyone involved in the production. It was a thrilling experience to bring an important part of history to life. Did you know that Joyce actually took a class in Irish with Patrick Pearse, the leader of the 1916 Easter Rising, at the Jesuit University College in Dublin. He apparently took offence to Pearse continuously emphasizing the superiority of the Irish language. After just a few classes, he stormed out when Pearse denounced the English word “Thunder” – a favourite of Joyce’s – as an example of verbal inadequacy. James Joyce 1916, Dublin, Easter Rising, Irish Writers, James Joyce, Patrick Pearse, The Rising. permalink.